The child is sad that the Sabbath is about to end. The rest of the week is dark, difficult, full of worry, only the Sabbath is full of happiness and peace. It ends when three stars can be seen in the sky. The child tells grandmother there are no stars to be seen yet, but she sings the prayer that signifies the end of the holy day of rest. 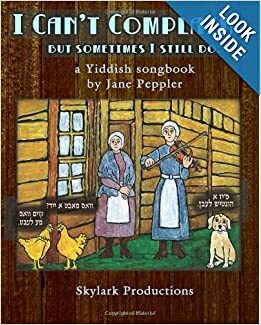 Or you can buy a book of all the songs in our "I Can't Complain but Sometimes I still Do" album for $9.81 from Amazon (click on the book image to be taken to Amazon). OR you can buy a digital download of the book for $6.50 and print it out yourself.